“I don’t think you should go into Tunnel 3,” announced our guide in South Korea. “But I’ll be just the same as anyone else in a dark tunnel,” I protested. “I don’t think it is a good idea,” she repeated. At this moment my husband Ron jumped in and told our guide that I had done many amazing things and that this would be another one of them. With that, I grabbed Ron’s arm and with my white cane in the other, we took off, into the dark and damp tunnel, and began to descend 70 metres down. I didn’t tell the guide that what I was more worried about was my asthma. Not that it was very bad, but they did give a warning on the bus that if you had asthma or a heart condition then you should not go into the tunnel. So when I found myself standing my ground on behalf of my total blindness, the asthma argument seemed to disappear. As Ron and I descended down the gradual slope, we were joined by hundreds of others. I could smell the musty air and feel the enclosed nature of the 2 x 2 metre gap where we were to walk. Access to the tunnel itself was 365 metres long, and at the halfway point we were to put on a hard hat and bend down as we crouched our way towards barrier 1. It was at this moment I connected with the 30,000 North Korean soldiers who came through the tunnels in the space of one hour at 4 am on 25 June 1950 with the intention to invade South Korea. As I crouched down, Ron would call out “duck”, “duck” as he guided me down and down. We had made it through to barrier 1, the final point on this tour and as I touched the end of the tunnel with my hand, I felt victorious, knowing that I had made it. All I had to do now was to keep calm and repeat the process in reverse. We followed our footsteps back passing person after person in this small space and before long we were climbing up the slope we had walked down. This was in fact the harder part, walking down what seemed a gradual slope, was far more of a pull on the way up. “There’s a railing you can use to guide you,” informed Ron. I put my hand out to feel for the rail and used it to help me walk up the tunnel on my own, more importantly, at my own pace. I made the steady climb before reaching the entrance of the tunnel, victorious for the second time in 40 minutes. I had done it! I had entered the infamous DMZ, the Demilitarised Zone, between North and South Korea and walked this historic tunnel, without sight, or asthma. I am so pleased that we didn’t listen to what the guide thought I couldn’t do, and instead listened to what I thought I could do! The next 35 days was spent exploring the wonders of Cambodia, Thailand and Vietnam. We visited the famous Buddhist temple Angkor Wat and the confronting Killing Fields in Cambodia, the bridge over the river Kwai in Thailand before visiting the cave networks of Halong Bay in Vietnam. No visit overseas would be complete without trying to track down some of my blind brothers and sisters. 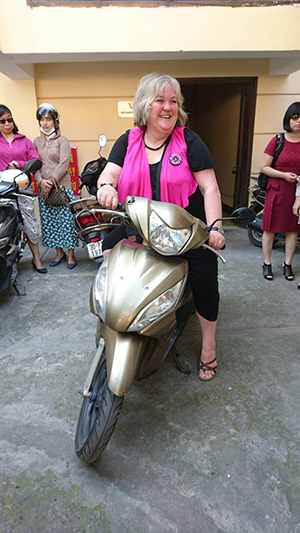 Thanks to the help of May Ajero at the Blind Foundation in Auckland through her international networks, she managed to secure a visit for us to the Vietnam Blind Association and the Hanoi Blind Association. Ron and I were picked up by a man who spoke no English and driven through the busy roads of Hanoi until we reached the Vietnam Blind Association. We climbed the steps up to the Association’s boardroom where Ron and I met with their leaders. Viet Anh, Ha and Hai, along with a contact of May’s called Nhu who worked for an NGO concerned with clean air. Nhu was Vietnamese born and spoke good English so between Nhu and their translator we were able to share the practises of our own countries with regards to blindness services. I sat next to a blind woman called Ha who spoke very good English, not surprisingly, as she had an MBA from Quebec University in Canada, as well as having two young sons. After talking for an hour we retired to lunch and headed back down the flights of stairs, not before Ron noticed the portrait of Ho Chi minh that sat above the board room table. As we stepped out onto the busy Hanoi streets and waited for our driver to take us to lunch, Ha grabbed my hand and placed it on her head. “You’re wearing a helmet,” I commented. Oh my goodness! Blind and on the back of a motorbike. But in Hanoi, it’s what 7 million people do every day; it’s how they get around. Blindness was no different and why should it be. I couldn’t help but have a little smile at imagining some of my blind Kiwi friends hopping on the back of a motorbike between appointments. “Do you want to hop on?” asked Ha. “Why not” I replied as I put my leg over the stationary bike, with just enough time to pose for a photograph. Just for a moment, I felt what it would be like to be blind and on a motor bike. Every day I am away I write a blindfulness diary, one thing I smell, hear, taste and touch. Let me leave you with my entry for Friday 2 November, 2018. Smell – the fresh bread stick we pulled out of the bin at the supermarket to eat for our tea. Hear – the sound of the interpreter called Hai, translating my words into Vietnamese as I spoke to 170 blind people at the Hanoi Blind Association. Taste – when I asked what it was, they said “deep fried bird”. Touch – the feel of the motorbike that I sat on when I stood outside with Ha.